After reading the title to this post, you’re probably uttering the word, HUH? As most of you know, Jason Walker and I co-wrote his memoirs entitled, “Missing My Body”. Well, after loading the book on Barnes & Noble and Amazon.com, I really haven’t had time to do much within the promotion scheme of things. Jason has a rare form of Duchenne’s Muscular Dystrophy and is a quadreplegic. My friend plans to have booksignings for him at some bookstores. However, Jason gently reminded me he can’t sign his books. His Mom, Linda Walker came up with the great idea of having him do thumbprints on the books! She would simply ink his thumb as people line up for his “signature”. More details will be posted about his appearances (if you’re in the southern Georgia, Tallahassee, Florida region). Taryn Simpson is a fulltime ghostwriter who looks forward one day to gaining wealth and fame. Cheers. On September 30th, 2007, I woke up from a very relaxing sleep to realize that I was late for the start of the last day of this year’s BBF. I had planned to make an early start of things in order to enjoy the readings of some of my friends and colleagues. So I quickly got myself together and headed down to the festival. Fortunately, I was in time to hear most of the readings of Works in Progress, sponsored by Gregg Wilhelm’s CityLit Project and moderated by Paul Lagasse, MWAB’s President. Unfortunately, I missed the first reading by Edith Goldman of her work “Pan-delerium,” though I’m sure it was excellent. Michael M. Hughes, a local horror writer, read an entertaining and funny piece called “Lunch Meeting.” Barabara Friedland read an excerpt from her upcoming novel A Member of the Force, based on the true story of a local murder case. Having heard and read earlier excerpts from the novel, it was wonderful to see that it is coming along so well. I think it could possibly become a Baltimore staple, one of those novels that people mention when they talk about Baltimore’s literary scene. Jen Michalsk’s reading of “The Movie Version of My Life,” from her short story collection Close Encounters, was another interesting read. It was, if memory serves correctly, my first introduction to her work. Mathew Lee Gill’s novel excerpt “Broken Charm” was a telling piece about a shady characters. Lalita Noronha also read an excerpt from her novel in progress. Afterwards, I purchased a copy of her short story collection Where Monsoons Cry. The last time I heard her read at one of the MWA meetings, her writing stuck in my mind and I knew before she finished that I would be purchasing a copy. Lauren Eisenberg Davis read a selection from her memoir-in-progress. Eric D. Goodman read “The Silences” from Tracks, his novel of interconnected stories. It’s always good to hear Eric read; in fact, a few months ago he read “A Good Beer Needs a Good Stein,” one of my favorite pieces from the novel, on NPR. It’s an excellent example of how authors should read their work, and a first-person version of the story is available at To Be Read Aloud. Last, but not least, Ian Hochberg read several of his poems. I was reminded of the beat poets, he just had an energy about him that was so fun to watch and his pieces were engaging. I enjoyed the readings so much (despite having to take a seat outside of the tent because of my late arrival, and therefore baking in the hot, hot, too hot sun), and afterwards I chatted briefly with some of the other writers before heading off to find some food. Even though hadn’t had breakfast, I ended up waiting several hours to buy something to eat–a soda sustained me while I walked around and decided on what books to devour. Last year I didn’t have much time to purchase. This year was different. Thanks to huge discounts, I walked away with two bags full of books, magazines, and miscellaneous items. Raw Dog Screaming Press (publisher of the wonderful book Vacation by Jeremy C. Shipp) was on hand, and we talked and I browsed and on my second time around—after deciding on what I would and wouldn’t purchase—I bought The Bizarro Starter Kit: An Introduction to the Bizarro Genre. It turned out that one of the men I chatted with, John Edward Lawson, was also featured in the collection and he signed it for me. I also purchased several copies of the literary journal Mosaic. It was a surprise to find out that such a professional publication was no longer stocked in bookstores. The publisher and I talked a bit about their attempts to get it back into stores now that the magazine is non-profit. I personally prefer to buy literary magazines from the stores, whether a big chain like B&N or a local independent, simply because of problems with receiving subscriptions in the past, but maybe I should re-evaluate that policy. Maintaining a lit mag is undoubtedly a difficult job. 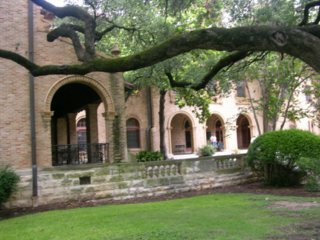 There were many other events that I enjoyed, including a staged reading of Jane Eyre by Charlotte Brontë, musical performances, and I bought several more books. But eventually my legs wore out and I was nearly past my spending limit, so after a quick stop at the Walters Art Museum and a local aromatherapy shop, I grabbed my bags and headed home. Good times. I always knew that working as a writer would mean that I would need to be prepared to don many hats in order to be successful. Those of you that are writers know what I mean. For example, written a book lately? Not only do you have to write the book, you need to market it, seek out publishing for it, call bookstores about stocking it, make sure it gets listed on top retail online bookstores and so on. And, now the rage is book trailers. So, either you must get really creative and make one for your book, or you need to seek out someone that can do it for you. What about blogging about your book? That seems to be the “thing” to do. It is a nifty self-advertising web presence. Then there is press releases to write, newspapers to contact, tv interviews to seek, and so on. The job is never done. Really. It could be a fulltime job just tending to the marketing and publishing efforts alone. I have to say, I have learned alot and learned things that I never thought I could do. So, in a way, that is a good thing. Oh, did I mention that seeking out reviewers and book contests was another duty? Sigh…a writer’s work is truly never done. I just know I have to write. The International Book Fair in Beijing! Well, the time is drawing near when “The Mango Tree Cafe, Loi Kroh Road” will be on display at The International Book Fair in Beijing. The book is scheduled to be shown by the Jenkins Book Group to various book retailers that are looking for books to stock on their shelves. I can tell you that from the looks of things, the novel has been practically flying off the virtual shelves at Amazon.com and Barnes & Noble.com! If you’re in the area on Aug 30, 2007 – Sep 3, 2007, please feel free to meet Alan Solomon at this book fair. 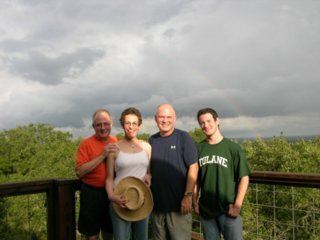 DAY TWO: June 28-Bristol, TN-Nashville, TN (visited UT) dinner Bosco’s with Jeff and Miramichee girls Kellye & Betsy. DAY THREE: June 29, Breakfast at Noshville with old friend, Emily, Nashville-Memphis, TN, dinner at Cafe Ole with many delightful Miramichee girls and assorted others of all ages and sexes. DAY FOUR: Memphis, reading at National Civil Rights Museum, lunch at the Rendezvous, H.S. reunion in evening with fabulous-looking former classmates. DAY SIX: Tour of Tulane and the Garden District, drive to my brother’s ranchette near Wimberley, Texas. DAY SEVEN: Tour of San Marcos and the Aquarena, a strange nature center that used to be a water amusement park featuring mermaids and Ralph the Swimming Pig. I remember this from childhood. We took the glass-bottomed boat to see the springs and then the boardwalk over a swamp and saw herons and scissortail flycatchers. DAY NINE: Toured Austin, University of Texas. Headed out after tour returned and made it to Texarkana by 11 p.m.
DAY TEN: Texarkana to Nashville. 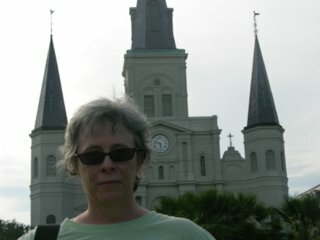 DAY ELEVEN: Nashville to D.C.
We went to New Orleans on the 2007 Tour of the Southland. The first time I had been back since Katrina. I had been there for a week in June 2001 staying at the Ritz Carlton for a convention where I was on the staff. 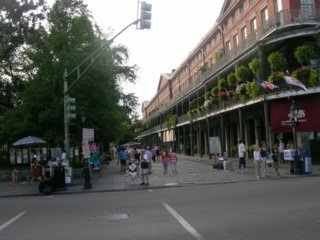 Physically where we were this year (the French Quarter and the Garden District) we saw little obvious damage. The Super Dome is rebuilt of course. We saw lots of construction and a couple of burned houses in the Garden District, near Carrollton Ave. Otherwise it was as beautiful and exotic as it has ever been, hinting of so much. But but but … the energy has been sucked out. The streets are not as crowded. A sign at Cafe du Monde on Jackson Square says, “Please seat yourself.” The last two times I was in New Orleans the lines were blocks long to get a seat. Bourbon Street had people, we saw a crew of tap-dancing kids leaving, there were eccentrics and freaks, but not so many, not so flamboyant. The old black man with a white beard singing “Sitting on a Dock of the Bay” on Jackson Square was really good, but he didn’t have much money in his guitar case. I was born in Texas, in San Antonio. We moved to Memphis when I was six. 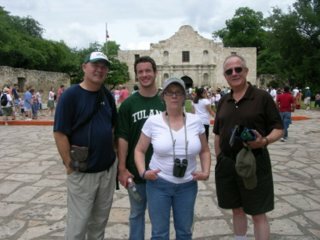 This trip we went back to San Antonio, saw the house where we lived and went downtown to the Alamo and the River Walk. I thought I would remember it, have that emotional kick of memory. Nothing. We saw Joske’s, the department store whose jingle I remember perfectly. Nothing. It was like I had never seen it before. Same with the Alamo. I only remembered it as if I’d seen it in pictures. We went through the Villetta, the old city where my brother tells me I always begged to go to the old glassblowers shop. ??? Really? The glassblowers shop just closed last year. It had opened a few years after I was born. Strange, strange. The River Walk was lovely though. And in Austin, I couldn’t get a sense of the city at all either. The coolness doesn’t hang in the air. I think I missed trees. I’ve lived so long in the East that the absence of big trees is oppressive. I would just like to announce that for a limited time (one month) you can purchase Everything’s Eventual: 14 Dark Tales by Stephen King and Portraits in the Dark together on Amazon.com. By purchasing together, you will save an additional 5%. And while you’re at it, go see the movie “1408” if you haven’t already. I’ll be seeing the movie soon and will let you know what I think of how it compares to the short story! Everything’s Eventual by Stephen King and Portraits in the Dark by Nancy O. Greene on Amazon.